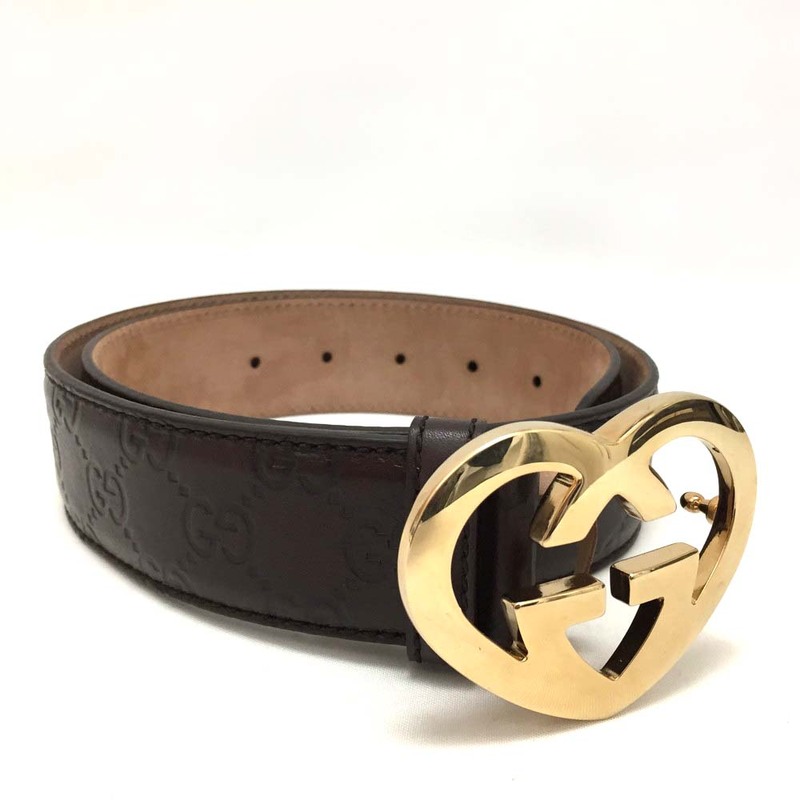 A pre-owned .100% Authentic GUCCI Sima Heart GG Buckle Gold Brown Leather Belt 30 inch /3188. The Over all is not really new but not really used. Looks like new. The item is sold in AS IS condition. Please check the photos for more details. ※Sizes are measured by ourselves. Please be easy on a slight difference. W: Junk badly damaged must check explanation. We judged by the criterion of our store about the products condition and level. The item is pre-owned unless otherwise description NEW in the title. ◆Although we try our best to describe the condition of each item with pictures, please note that items may have unnoticeable flaws. ◆Some used goods may have an unpleasant smell, also, most bags are somewhat deformed. ◆The color of the product may not be displayed correctly because the state of lighting and the display of the PC are different in the picture. Please check the photos deeply, and if satisfied, then please purchase. ■We only sell authentic items. ■Regarding dust bags and boxes, if there are the accessories in the photos, it will be shipped together. And, The attached box and dust bag may not be the box that originally contained the item. Mostly we have set a matching it size. ■Please understand that we don't offer "BUY IT NOW" unless otherwise stated in the auction. ■Regarding COMBINE, if you win an auction for any additional items within 5 days of the first item you won, we are able to combine these for shipping. In such a case, we revise the shipping fee in the invoice. But, basically it is asking for payment within 2 days, so please let us know immediately if you are bidding to other auctions. And, please requested us a hold offer BEFORE payment because we cannot hold it for you after the payment. ■IMPORT DUTIES & TAX are not included in sales price or shipping cost. These charges are the buyer's responsibility. Please check with the local customs office of your country of residence prior to making purchases to assess the additional costs. These charges are normally collected by the delivering freight (shipping) company or when you pick up the item. Do not confuse them for additional shipping charges. ■We DO NOT ACCEPT to declare at under-value merchandise or mark the item as a "GIFT" on customs forms. Such actions are against the international laws. Please check extra taxes at your country before bidding our items. ■Please contact us before leaving neutral or negative feedback. Please pay within 2 days. The Unpaid item case will be opened after 2 days automatically unless with prior agreement. If you can't pay now or within 2 days, please refrain from bid of the auction. The item will be shipped from JAPAN. ■WE ONLY SHIP TO PAYPAL REGISTERED ADDRESS. ■Delivery takes about 4-7 days to Asia & USA and Delivery takes about 5-10 days to Europe. ■Please be aware that delivery could be delayed depending on customs inspections, in case of natural disasters, and other reasons such as postal strikes. ■*Delivery restrictions in the US. We are unable to deliver to Military APO/FPO/MPO addresses with the 3-digit ZIP code prefixes 090-098, 962-966, and 340. We are also offering 30 days return policy on every item we put on our list. If you are unsatisfied about the purchase, all we ask is that you return the item in the condition received. Return shipping charges will be buyer's responsibility. In addition to insurance cost, custom tax and duties are not refundable. Please contact us directly via ebay message before making decisions on returns to get proper instructions and quality service assistance. *In order to avoid unnecessary returns, please pay close attention to the item description and pictures before making the purchases. As the professional seller of brand name goods in Tokyo, Japan, we list only authentic second-hand designer bags, handbags, accessories of some the most prestigious luxury brands. ■We are open weekdays from 9:30AM - 6PM JST. We are closed on Saturday and Sunday JST. Therefore, please understand that we cannot ship, or respond to mails during those times.